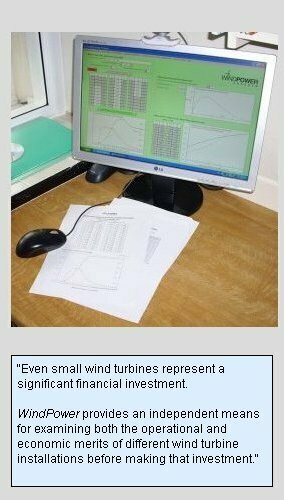 The WindPower Program and the UK NOABL Wind Speed Database Program. 1. The WindPower and UK Wind Speed Database programs. There is a considerable interest in wind power as a contributor to reducing our dependence on fossil fuel power sources. Unfortunately, the whole area is bedevilled by misunderstandings about precisely how much power can be obtained from wind turbines of all sizes and what exactly is their economic value. The WindPower program is aimed at clarifying some of these uncertainties. It is intended for both individuals and organisations. The UK Wind Speed Database program is intended to present the Department of Energy and Climate Change's database in a more user-friendly form and to give users a better feel for the link between wind speed profiles and topography. Clearly, it is of use mainly to those concerned with UK wind power. 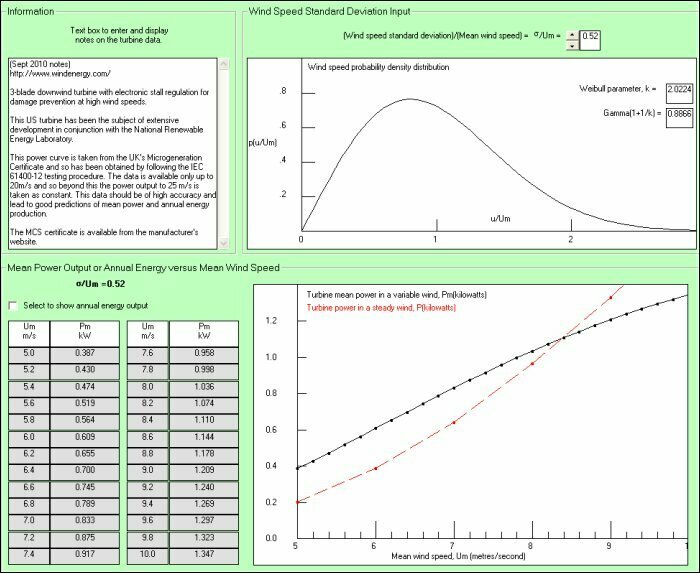 In addition to the WindPower and UK Wind Speed Database programs, this website covers a number of general issues associated with wind power such as wind statistics, the calculation of mean power, maximum turbine efficiency and the intermittent nature of wind power. The web pages on these topics can be navigated to from the technical webpage menu on the left. There is a also a reference library web page from which various publications and papers on wind power can be downloaded. This web page also gives access to accreditation test reports on a number of small turbines. Finally, there are a few videos on wind power which visitors to this site may find useful. WindPower is an interactive computer program that can be used to calculate the performance of wind turbines ranging from small domestic units with rotors of a metre or two in diameter up to the largest commercial units with rotor diameters of around 100 metres in diameter. It can be used for both horizontal axis wind turbines (HAWTs) and vertical axis wind turbines (VAWTs). It calculates mean power and annual energy outputs and enables the economics of a particular turbine to be estimated as a function of the mean wind speed at the site. An individual user interested in a small 'domestic' wind turbine who wants to assess the performance and economics of a possible installation. A land owner (farmer or estate) interested in a medium to large wind turbine who wants to assess the performance and economics of a possible installation. A wind turbine installer as a sales presentation aid in outlining the characteristics and options of an installation. A consultancy firm advising clients on wind turbine applications. An organisation like a school, supermarket or any company considering the installation of a turbine on their premises. Planning authorities responsible for assessing and monitoring wind turbine proposals. AND college and university students on courses on renewable energy. The mean power and annual energy output as a function of mean wind speed and the level of wind variability. Estimates of the return on investment as a function of mean wind speed and reference electricity costs. Estimates of the payback period as a function of mean wind speed and reference electricity costs. Estimates of the cost per kilowatt-hour as a function of mean wind speed and turbine lifetime. A power output profile showing the percentage of time that the turbine produces different levels of power including the zero-power output case. For a turbine using energy output locally, an estimate of how much energy will be used locally and how much will be exported to the grid. The full version of the program (available from the download page.) costs £25 - about 40 US$'s or 30 Euros. Payment in any currency can be made by credit card or PayPal . 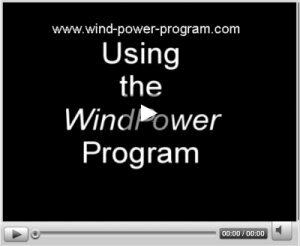 The full program gives access to our downloadable database of over 100 hundred wind turbine power curves. A user of the program can add new power curves to the database but, in any case, the database is updated typically every month or so. NOTE: A free trial version of the program can be downloaded to gain familiarity with the program usage. What do I need to know and is it easy to use? Clicking on the image link below will show a video on using the program with links to two further videos covering the financial options and the power profile part of the program. WindPower is a technical program and so some basic understanding of wind turbine performance is necessary. The basic data needed are the rotor diameter, the cut-in wind speed, the cut-out wind speed and the steady wind power curve. All of these are generally available from the manufacturers' websites. By clicking on the link below, a pop-up window will appear that defines these quantities. A more comprehensive guide to wind turbine basics is given on web page 14 or in the program help files. The opening form in the program contains a input frame shown below in which all the data are entered. The rotor diameter, cut-in and cut-out speeds are adjusted with the scroll bar controls shown in the figure. After clicking on the "Initialise data input table" button, the power curve values are entered into the table between the cut-in and cut-out speeds. 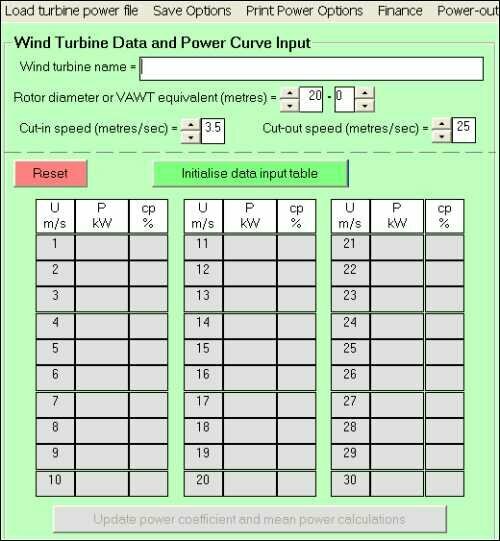 This manual entry process is generally unnecessary as the wind turbine database available for download from this website contains the power curves for a large number of commercial turbines and these can be loaded directly into the program. In any case, if the data have been manually entered, they can then be saved for later use. Once all the data is downloaded or manually entered, the "Update power coefficient and mean power calculations" button is clicked and the pane then displays the steady power curve in graphical form along with the power coefficient, cp, (i.e. efficiency) values of the wind turbine - as shown below for a US 'domestic' wind turbine - the Skystream 3.7. The power coefficient results (defined in the help files and on web page 14) are useful for two purposes. Most obviously, they indicate how good the turbine blade design is but, secondly, if they are excessively high, it suggest that the manufacturers' claims may not be accurate. Typically small turbines have peak power coefficients of 25-35% whereas large commercial turbines lie in the range of 40-50%. There is a theoretical upper limit on turbine power coefficient of about 59% (see web page 17) and so any values near or over this should be treated with great suspicion! When the update button is clicked, the opening form also has a frame that displays the mean power results as shown in the figure below. In many respects, these are the most important results provided by the program and, for those interested, the method of calculating mean power is described in web page 16. 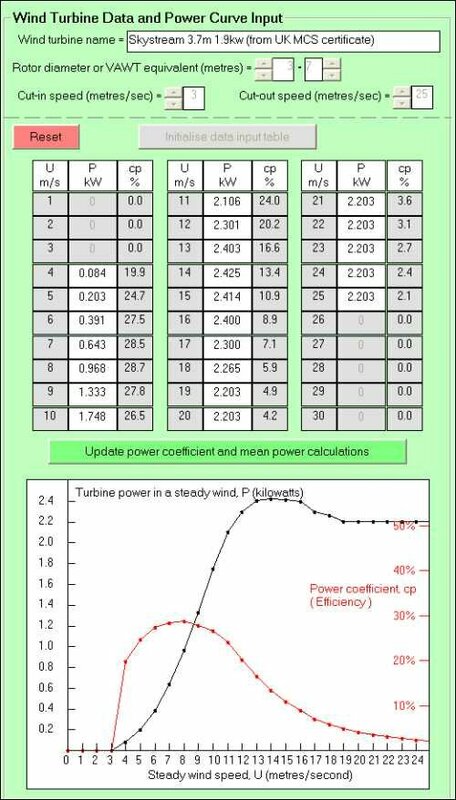 They show (in graphical and tabular form) the mean or average power that can be expected from the turbine as a function of mean wind speed. The mean wind speed range is from 5 metres/second to 10 metres/second. A site with a mean wind speed of less than 5 metres/second is not really a viable site for wind power. A site with a mean wind speed of 10 metres/second would be exceptionally windy (although they do exist) but sites within the speed range from 6.5 - 8.0 metres per second are more typical for potential wind turbine installations. The table on the form can also show the annual energy outputs in kilowatt-hours simply by ticking a checkbox. The mean power results are a function of the variability or unsteadiness of the wind speed and the frame above the mean power frame enables this variability (as represented by the standard deviation of the wind speed) to be adjusted and its effect on the mean power instantly displayed. The standard deviation of the wind speed is a basic measure of how large the fluctuations in wind speed are and its significance is discussed both in the program help files and also in this website on web page 15. However, practical values of the standard deviation relative to the mean speed range from about 0.4 in a very steady wind such as is found in some desert areas to around 0.8 in the very turbulent winds in an urban environment. In the wind farm terrain typical of much of the USA and Europe (including offshore farms), the standard deviation will be close to the default value in the WindPower program of 0.52. Also on the mean power display is a plot shown as the red chain dotted line of the power output from the turbine in a steady wind. This shows that at the lower speeds, the mean power output is significantly greater than the output at the same steady wind speed. This is simply a consequence of the non-linear behaviour of the power curve and the fact that the mean power benefits from the wind excursions to the steep part of the power curve. By contrast, at high mean wind speeds, the high wind speed excursions move onto the flattened region of the power curve that is a result of the power limit of the electrical generators connected to the rotor. The mean power then becomes less than the steady power output. The crossing point for most turbines is around the 8 metre per second point. Finally, it is often stated that turbine power varies like the cube of the wind speed. However, this is incorrect and misleading. The available power in the wind certainly varies like the cube of the wind speed but, as illustrated above, turbines do not have a constant efficiency in converting this potential power into shaft power and when coupled with the unsteady nature of the wind, the mean power output does not vary anything like the cube of the mean wind speed. It is often only slightly better than a linear relationship. Next, the returns to cost ratio, payback period and cost per kilowatt-hour menu options.